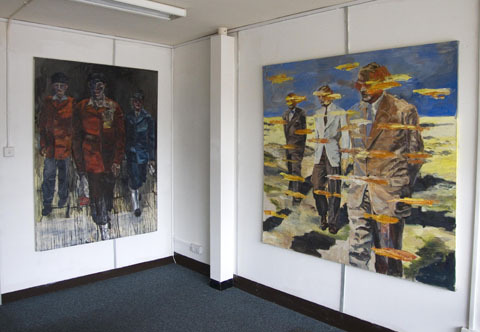 The works on show here vary in size, and show experiments with colour. There’s a nod to Philip Larkin with Whitsun Weddings, a large painting of a traditionally-dressed couple, and Heap looks like a huge pile of clothes, or blocks of colour. Young Man Among Flowers and a similar one show young men in caps, surrounded by flowers, and one called the Futurists show his interest in so-called authority figures and the idea of joining dodgy groups. Another painting, Moment of Reconfiguration, has a similar message, showing men in suits walking with marks across their faces, showing they’re no longer themselves. Terry, whose day job is as a builder, says he’s saying don’t join any political organisation because it will make you become someone else.